Choose from the deep, rich tones of chocolate, or the subtle, warm tones of honey for your interior colour scheme. 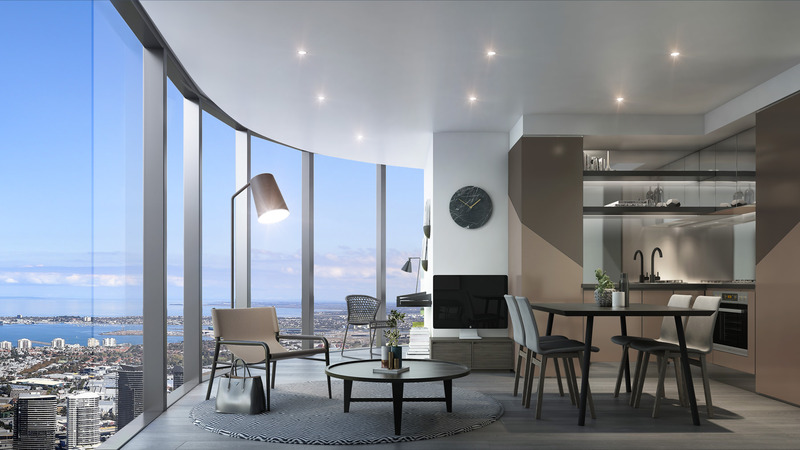 Floor-to-ceiling glass delivers expansive views at every opportunity and customised lighting pieces add an extra flair.  Floor coverings move from the warmth of timber floorboards to soft wool carpets for extra luxury. Make your home your sanctuary, with a look that suits your lifestyle. 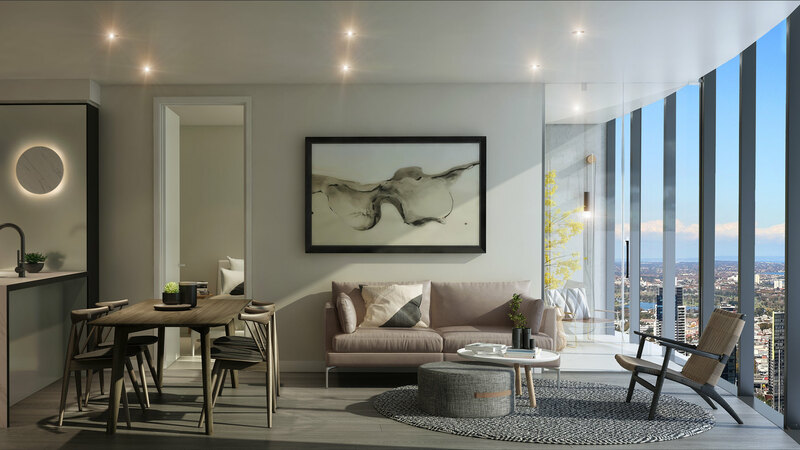 Cool contemporary black metal details contrast against the sleek elegance of metallic 2pac joinery, with timber flooring and open plan design to accommodate easy urban living. In the kitchen, the mirror and stone splashbacks add a refined touch – a stylish complement to the natural stone benchtops, designer tapware and contemporary European appliances. Welcome home – enjoy the views. 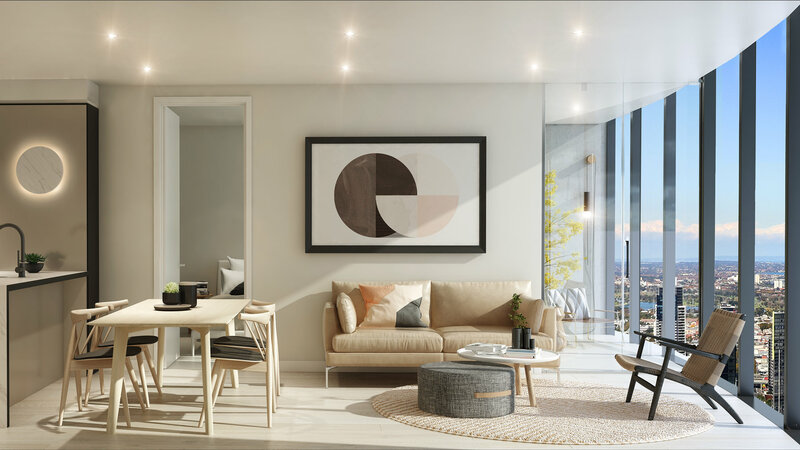 The feeling here is calm and easy, with the golden hues of this interior scheme, it’s the ideal backdrop for relaxed living, as your sweeping city views take in the bustle below. Customised lighting pieces highlight the open-plan living space and the golden warmth of timber flooring, with the mirror and stone kitchen splashbacks adding an additional shine. In the kitchen, metallic 2pac joinery, black metal detail and natural stone benchtops create a clean, uncluttered look, and European appliances offer easy entertaining. 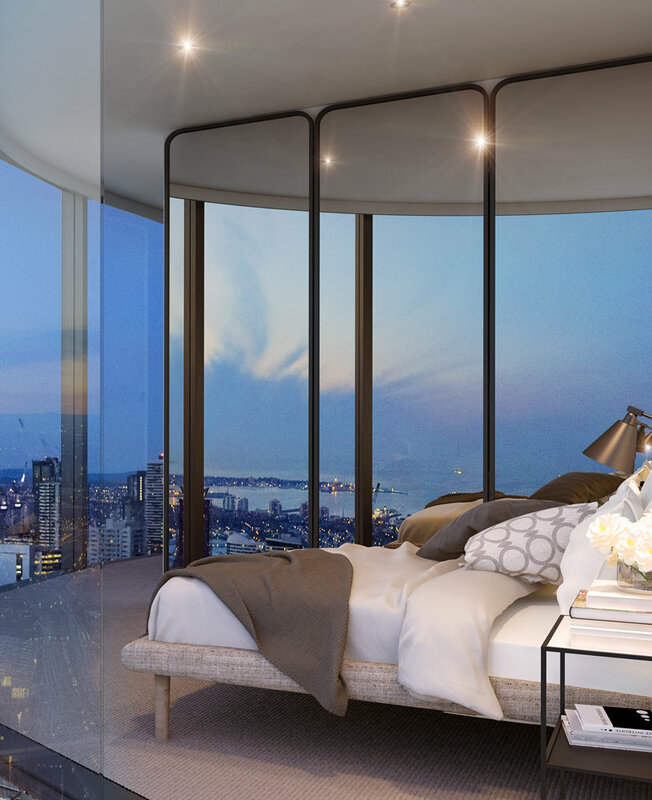 The stunning views from your spacious bedroom make your apartment lifestyle even more special. Wool carpet delivers pure comfort underfoot and custom built-in wardrobes make storage stylish. In the bathroom, feature wall tiles complement the clear glass of the shower door. 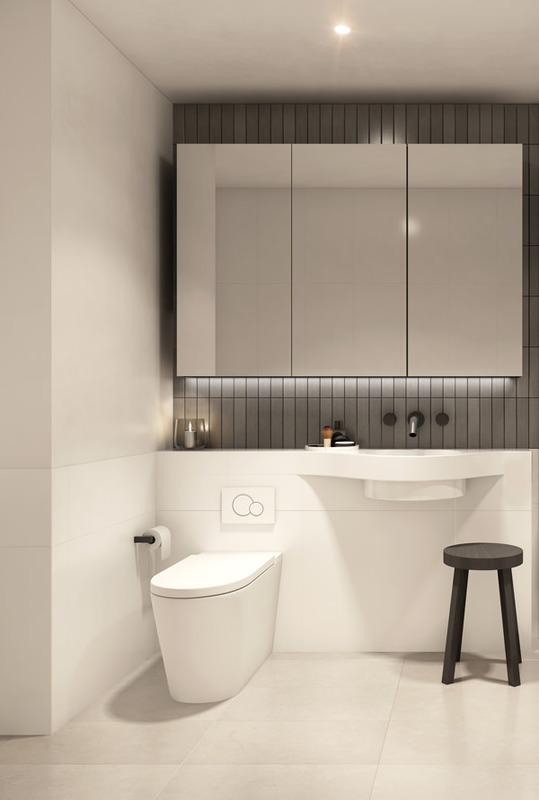 The customised vanity is built for pure style and designer tapware is modern and sleek. 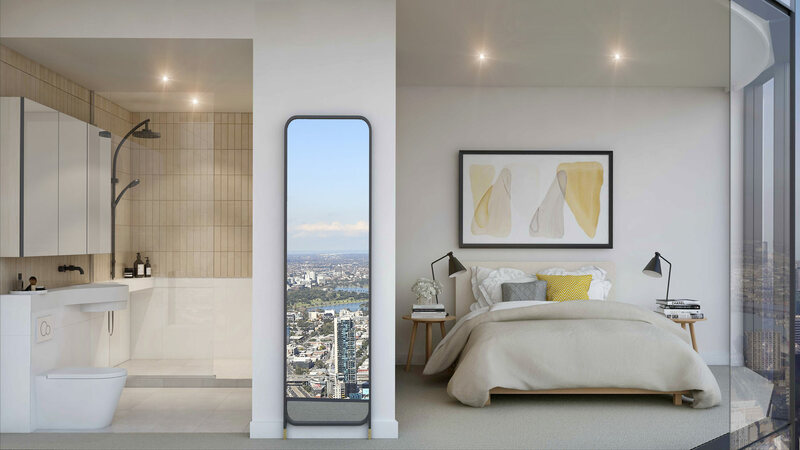 Clean, elegant lines for light-filled living, with floor-to- ceiling glass to let you enjoy Melbourne’s changing look – from colourful sunrise to night-time sparkle.